This card often conjures feelings of being robbed or cheated out of something. However , today I’d like to focus more on the intent of the character in the card who seems to be doing the cheating or robbing. Loki, from the Norse tradition, is the god of thieves and mischief. In one myth he tricked Hod who was blind, into killing his beloved brother Balder, son of Odin, with a dart made of mistletoe – the only plant which had not sworn to never harm Balder. The imagery on this card is reminiscent of the wiles of Loki, and particularly prevalent on the face of the main character as he sneaks away in mischief. 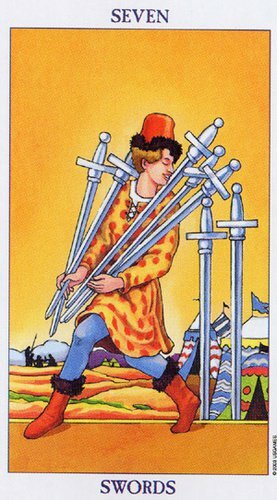 In the seven of Swords card, we see a figure tip-toeing away; silently carrying away swords that clearly do not belong to him. It is apparent from further examination of this card that the scene is one of a jousting tournament. Tournament tents colourfully displaying their competing flags stand in the background. In the distant background a circle of knights stand together discussing the tournament in preparation of the competition. The scene is set for knights to display their skill and strength in this most important tournament. As was customary, the knights would bring their squires to such events. Medieval squires were the servants of the knights, in their training to become knights themselves. It was a very noble profession to be a knight, and a privilege to be a medieval squire, as that meant, more often than not, a potentially promising future if trained and knighted. Back in the card, one can almost hear the squires of the various knights, hard at work in service of their masters to ensure that all the preparation are taken care of and that they have been thorough in their duties towards their knights. The squires – like all squires of the time – are young and still need to prove themselves. They are in the service of their knights who will eventually train them to become knights too. It would be self-defeating and self-destructive for these young squires to risk their entire future by being derelict in their duties towards their knights. Nothing could be more important to a young squire than to ensure that all his master’s needs and expectations are taken care of, and that he has been diligent in his duties towards his benefactor. Our attention is drawn back to the predominant figure in the card, that of the squire who is carrying away the very swords needed by the knights to perform their duty at the tournament. Judging by the expression on the face of the mischievous squire, he is not concerned at all with the consequences of his trickery! He has a self-satisfied grin on his face that tells us he finds the situation rather funny. A practical joker, that’s what this squire seems to be. Loki in all his mischievous glory. Which is all good and well, but how will the knights react when they discover that their swords have been misplaced, hidden or stolen from them? How will this impact on the tournament itself, that is kept waiting, while the tools of the trade are missing? Can you imagine the fury of the knights as they suffer humiliation at being disarmed? The fear of punishment and loss of future opportunities that potentially face the other young squires as their masters and knights look to them when it is discovered that their swords have been stolen, is almost tangible. Yet, it seems our irresponsible squire has not considered the impact of his practical joke on those around him, or himself. It seems that not a moment’s thought was given to the despair and confusion that this situation would cause for the knights, their squires and the tournament hosts. The severity of the situation is entirely lost on this squire. This card reminds us that we should be mindful of how our actions may aversely affect others, even if our intent was not to harm. It cautions us to take responsibility for our actions, and to recognize when we have inadvertently hurt others simply because we weren’t paying attention, or because we didn’t consider the potential consequences of our actions. When we do things that cause others pain, we cause ourselves pain. When we do things that cause us to work against our own hopes and dreams we are self-sabotaging. Consideration of others happiness and welfare is paramount in our quest for self-development, but, as with so much else it all begins with the relationship we have with ourselves.